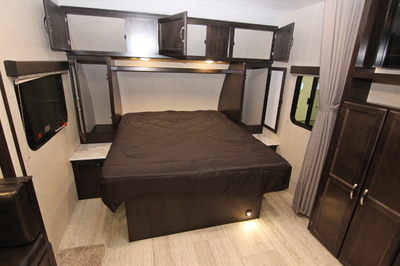 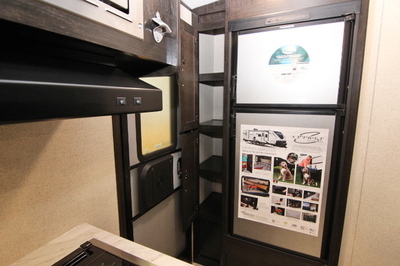 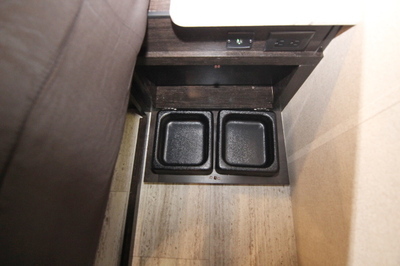 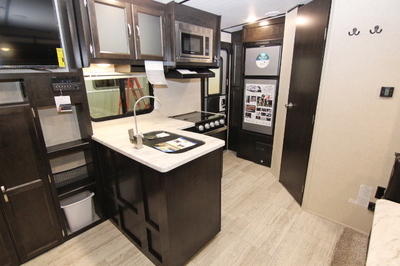 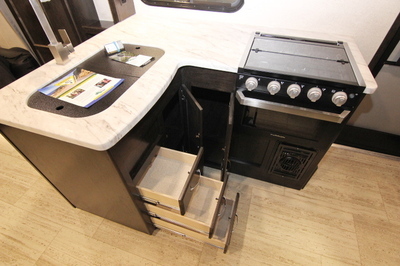 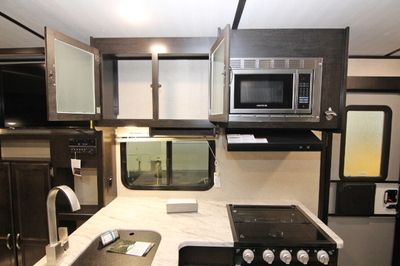 Packages and Upgrades Included with this unit:- Camping Simplified Package, Customer Convenience Package, U-Shaped Dinette, Exclusive to Lardners this unit has a Porcelain Toilet. 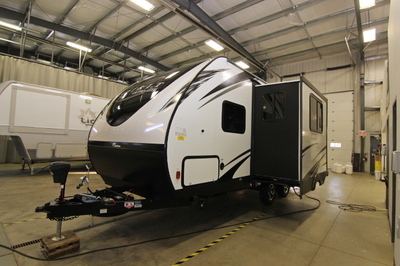 Camping Simplified Package: Vaulted Ceilings, “Twice Cool” Dual Ducted Air Conditioning System,Bathroom Laundry Hamper, Motion Activated Floor Lights, Reading Touch Lights,Lighted USB Ports, Sofa Cup Holders, Trash Can, Exterior Dog Leash Clip, Pet Center, Bottle Opener, Exterior Fishing Pole Storage, Kids Convenience Center(Bunk Models), Motion Activated Exterior Storage Light, ¾” Quick Connect Stabilizer Jack Bit, Solar Prep, Sink Cover Storage. 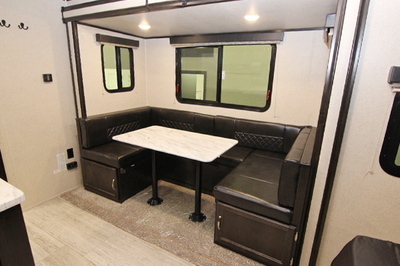 Customer Convenience Package: ¾ Gel Coat Fiberglass Front Cap W/LED Strip Lights, Aluminum Wheels,Spare Tire Kit, Power Awning W/LED Strip Light, Front Rock Guard, TV &Radio Antenna with Booster, EZ Lube Axles, Spread Axle Design, AM/FM/CD/DVD Bluetooth, LED TV, Satellite Prep, Night Shades, Microwave, Oven with 3 Burner Cooktop, 6 Cu Ft Double Door Fridge, Skylight in Bath. 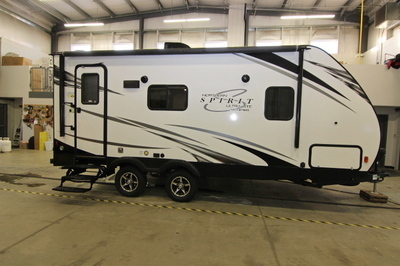 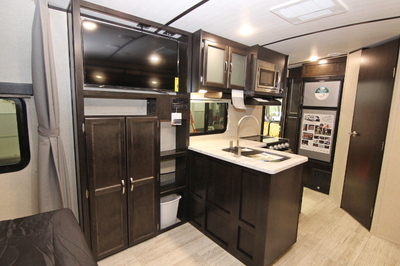 Exterior Features:- Magnetic Door Catches, Drip Rails w/ Downspouts, Heated and Enclosed Underbelly, Cable /Satellite Prep, Triple Entry Steps, Extended Grab Handle, Angled Stabilizer Scissor Jacks, Black Tank Flush, Exterior Speakers, Wide Stance Axles, Power Awning, Solar Prep, Porch Light, Dog Wash, Front Rock Guard, Power Tongue Jack,Spare Tire, Detachable Power Chord, 20lbs LP Tanks, Water Heater By Pass,Aluminum Rims, Maximum Stability Spread Axle Design, EZ Lube Axles. 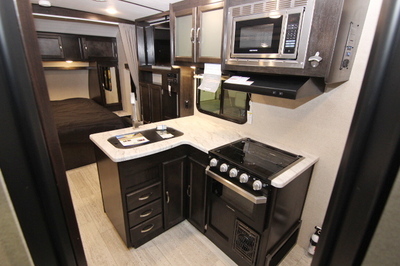 Kitchen/Living Room Features:- Magnetic Door Catches, Drip Rails w/ Downspouts, Heated and Enclosed Underbelly, Cable / Satellite Prep, Triple Entry Steps, Extended Grab Handle,Angled Stabilizer Scissor Jacks, Black Tank Flush, Exterior Speakers, Wide Stance Axles, Power Awning, Solar Prep, Porch Light, Dog Wash, Front Rock Guard,Power Tongue Jack, Spare Tire, Detachable Power Chord, 20lbs LP Tanks, Water Heater By Pass, Aluminum Rims, Maximum Stability Spread Axle Design, EZ Lube Axles. 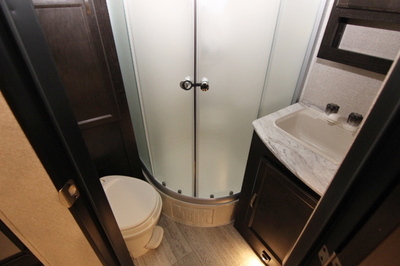 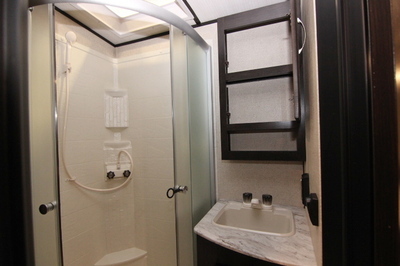 Bathroom Features:- Designer Shower Curtain, Towel Hooks, Tooth Brush Holder, Tub Surround, Power Vent,Skylight, Seamless Thermo Foil Wrapped Countertop. 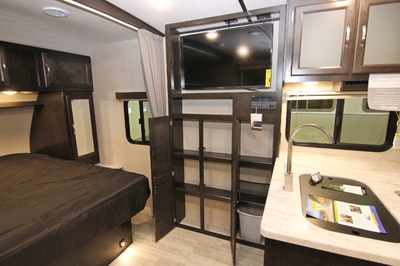 Bedroom Features:- Bedside Night Stands, Shirt Closets, Lighted USB's, Outlets, Above Bed Shelf, Designer Comforter, Reading Lights, 60" X 80" Queen Bed. 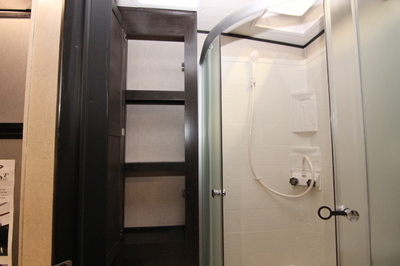 Pet Friendly Features:- Exterior Dog Leash Clip, Dog Wash, Pet Center. 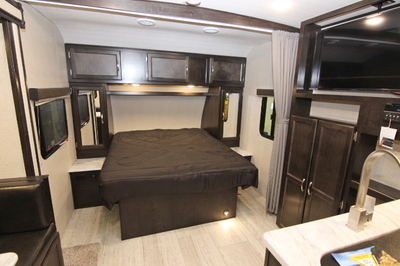 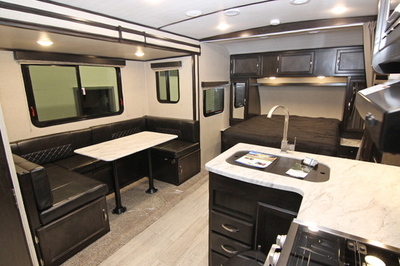 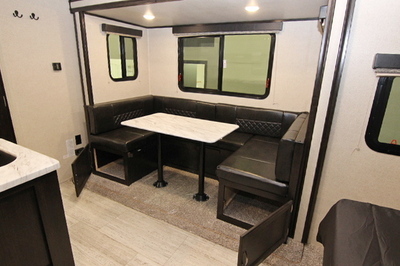 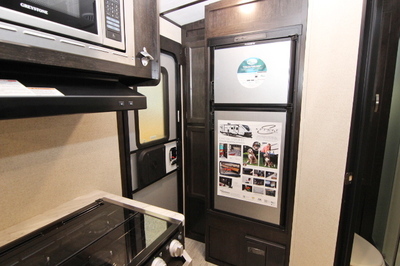 Construction Features:- Norco NXG Frame, Laminated, Aluminum Framed Floor, Laminated, Aluminum Framed Sidewalls, 3/4 Painted Fiberglass Front Cap w/ LED Strip Lights, Azdel Composite Panels in place of Luaun Plywood, Full Walk On 3/8" Roof Decking, Rubber Roof Membrane, 5" Trusses w/ Interior Vault, Lumber Core Cabinet Stiles, Pocket Screwed Cabinet Stile Joints, Mortise and Tendon Cabinet Doors.